Only a few days until The Dark Knight trilogy concludes – until then here are some recollections on a few films from the past couple of months. The National Board of Review screened The Raid to members on March 23. I had the pleasure to do a Q and A with director Gareth Evans after the screening. Evans is a young (under 30) Welch director who went to Indonesia to study martial arts, was exposed to Pencak Silat, a traditional fighting style, and made the martial arts film Merantau in 2009. The Raid (“Redemption was added to distinguish the film from other “Raids“). Both films star Silat martial artist Iko Uwais, who plays a young man leaving his village for the dangers of urban life in Merantau, and a Swat team member fighting a vicious gang in The Raid. Evans was incredibly open and enthusiastic about his work as a director – to a degree that is rare and quite refreshing. His discussion of a certain stunt gone wrong in the film was the kind of thing that would send shivers down the spines of lawyers for any major film studio. 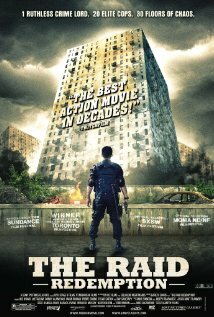 The Raid is a must-see film for anyone with an interest in martial art films – it is essentially a police versus crazy gang in an enclosed location story (the police execute an ill-planned raid on a public housing building infested with an army of drug users and a angry and determined drug lord). The film plays around and unending sequence of action scenes – most featuring Iko Uwais, who is essentially in a continuous life and death fight. The only exception is a brief interlude, a momentary lull in the eye of the storm with his estranged brother. Uwais does all of his own stunts – some of the most incredible fighting occurs between him and Yayan Ruhian, who plays the ultimate antagonist. Ruhian is a drug soldier known only as “Mad Dog”, a wild man who refuses a gun when offered because he literally delights in the physical sensation of breaking his victim’s necks. Ruhian also worked with Uwais as co- fight choreographers for the entire film. If you can find The Raid still playing in a theater don’t hesitate. Evans is already working on a follow-up, which thankfully won’t be called The Raid 2 (It is named Berandal). The NBR screened The Lucky One on April 19 for members, students and guests and I had the good fortune to do a Q and A with director Scott Hicks after the screening. Hicks has made a documentary about Philip Glass, directed Snow Falling on Cedars with Ethan Hawke and Max Von Sydow in 1999 and, most famously, Shine (1996) a real life story centered around the talented and eccentric pianist David Helfgott. It’s a film fixated on the odd and emotionally engaging talents of Geoffrie Rush. Hicks is lean, soft spoken, has shoulder length blond-grey hair, and is quite relaxed and thoughtful. I try to prepare for meeting and talking with directors, (and to some extent actors), by reading the source material that the films are based on. If a film is not an original script then it is most likely adapted from a story – either a novel or a short. I am alway curious about story telling decisions and love to compare the novel (starting place) to the script/film that is made from it. With Almodovar I was able to find a copy of the source text for his film The Skin I Live in. It is a very creepy French novella called (in translation) Tarantula, by Thierry Jonquet. Knowing the original text made it possible to identify the key moments when Almodovar made the story his own and to explore the adaptation process in a thorough way. The Lucky One is based on a novel by the successful and popular writer Nicholas Sparks. My exposure to him was through a number of the film students – all girls -, at one of the Universities where I teach. For writing assignments there were students each semester who felt compelled to choose The Notebook, based on Sparks novel about a man trying to get through to his wife, who suffers from progressive alzheimer’s disease. I can visualize each scene in my mind, though I have never seen the film, thanks to the many students each semester who feel compelled to take on this melodramatic romantic touchstone of a film. Published in 2008, The Lucky One is a novel that is an all-too-predictable potboiler that is also quite successful in bringing a tear to the eye and a flutter to the heart. Logan, an American soldier, in Iraq feels that something is keeping him alive – and decides that the talisman is a photo of a beautiful young woman from somewhere in America. He returns to the states to hunt her down and runs into a bad sheriff, who happens to be the ex-husband of Beth, the woman in the picture. You can imagine the possibilities. Hicks makes the best film possible from the source material – keeping the basic story intact and adding a few nice twists (for instance he heightens the narrative weight of the photograph by building a secondary story from Logan’s war days around it). Hicks is great with actors (Rush in Shine, for instance) and gets everything he can from cast, crew and locations (shot in New Orleans). Zac Efron is passable as Logan – but seems to be miscast. In the novel the character has very long hair that is always falling across his face, for instance. For a soldier who has been through three duties Efron seems a bit young and maybe too much together to be believable. Blythe Danner is great as the mom figure but the performance that really stands out is Taylor Shilling as Beth, the image in the photograph. Shilling displays a range of emotions that seems realistic and impressive. At the extremes, in her pleasure to see Logan and in her despair as she confronts her former husband, Shilling has a Jessica Lange like quality that is radiant and fun to watch. Following the June 7th NBR screening of Peace, Love and Misunderstanding I moderated a discussion with Jane Fonda, the film’s star. Fonda was her gritty and elegant self as Grace in the film and in person, discussing not only her relationship with co-stars Catherine Keener, Elizabeth Olsen, and Jeffrey Dean Morgan but also her collaboration with Beresford. Fonda also took some time to look back to discuss acting with Marlon Brando and Vanessa Redgrave. Peace, Love, and Misunderstanding is a somewhat too nice film by Bruce Beresford, who has directed such exceptional work as Breaker Morant (1980), Tender Mercies (1983), Driving Miss Daisy (1989) and Mao’s Last Dancer (2009). 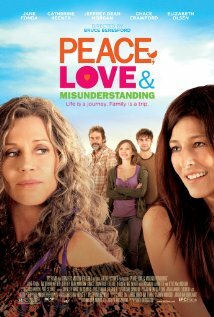 Peace, Love, and Misunderstanding makes great use of Woodstock, New York locations and real-life characters but – except for a plot line that follow the strained relationship between Grace and Diane (Keener), her onscreen daughter, and some bits about new found love between the younger actors there is little conflict or action. Still, there are fun moments and the film is probably better watched under the influence of something other than popcorn. Beresford is known for his strong work with actors and none in the film benefit more than Elizabeth Olsen, in a performance that predates her breakout role as title character in 2011’s Martha Marcy May Marlene. It’s a role that allows Olsen access into the professional world of a veteran director and some serious actors. She gives a fresh acting performance that stands out in an otherwise unengaging and light-weight film. On June 19, following an NBR screening of Woody Allen’s new film To Rome with Love, I moderated a discussion with actresses Penelope Cruz, Greta Gerwig and Ellen Page. Woody Allen – you love him or you don’t love him (“don’t love” is often, it seems, with a passion). Regardless of opinion, on a purely objective basis it’s hard to argue against the talents of someone who has been Oscar nominated fifteen times for best screenplay and six times for best director. And, for Annie Hall, he also picked up a best actor nod. And four shiny gold statues along the way. That’s a lot of accolade and hardware for a funny little guy from Brooklyn. Allen’s film track record has been exceptional of late, with the emotional and funny Vicky Christina Barcelona (2008), the cerebral Midnight in Paris (2011) and what feels like a collection of short stories come to life that is To Rome with Love. Whatever Works (2009) is a bit creeky, but features Larry David doing his best Woody Allen bit – and remaining mostly like Larry David. You Will Meet a Tall Dark Stranger (2010) didn’t work as well – the story of a writer (James Brolin) and his wife (Naomi Watts) struggling for money, while an older generation (Anthony Hopkins and Gemma Jones) struggle with divorce, loss and making fools of themselves. Still, three and a half good films out of five is not so bad. With To Rome with Love Allen has wrapped four stories of love – sometimes for people, sometimes for ideas – in a beautiful and varied Italian envelope, brought together a skilled and accomplished international cast, and given us a ticket to one of his supremely Allenesque tales of misunderstanding and misadventure. There are no intertwining of destinies here – characters do not suddenly appear in a tale they did not start in. The stories are intercut as they progress and each follow their own narrative arcs. Though unnamed, I will call them The Mistaken Prostitute, The Unlikely Singer, Revisiting Love, and The Price of Fame. Although the writing quality of the four stories varies a bit (Price of Fame, absurd and intimate at the same time, is the best written, whereas Mistaken Prostitute dips slightly because of a believability factor involving the separation of the two characters). Allen polishes each section of the film with his directing, location choices and, most helpfully, his inspired casting. Roberto Benigni was born to play the perplexed ordinary man who is thrust – for no apparent reason – into the role of national celebrity. Penelope Cruz, as the prostitute who must play, in a twist of fate, the fiancé of a young boy from the Italian countryside, has fun with the role by implementing all the ways she can be helpful and supportive to the befuddled boy in front of his family. The prostitute as friend and supporter. Judy Davis plays Woody Allen’s put upon and begrudgingly faithful wife in the Unlikely Singer story. Allen’s character, a retired experimental opera producer, struggles to find a way to exploit the talents of a man (real-life opera star Fabio Armiliato) who can belt out a powerful and moving aria – but only while taking a shower. 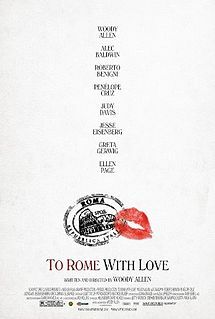 In the Revisiting Love sequence Alec Baldwin returns to Rome, where he frolicked as a youth and, in a bit of fantasy reminiscent of the time traveling in Midnight in Paris, encounters a young man and two women (Jesse Eisenberg, Ellen Page and Greta Gerwin) who seem to be reliving a potentially painful moment from his own past. Hovering on the edge of their lives, seen only by Eisenberg, Baldwin tries to convince the younger man not to fall into the same love trap that he did. During the shoot neither Page nor Gerwin knew why Baldwin appeared in scenes but did not interact with them – relying on their trust for Allen as a director to get them through each scene. A close friend said after the screening that Allen could have shot most of the film in any setting and the stories would have worked with little change in the writing. It’s true, but I really like to experience what it’s like to take a bit of New York, in the form of recognizably befuddled characters and situations from the mind of one of New York great filmmakers, and see how everything plays out when visually transplanted overseas. It’s a treat for a New Yorker who doesn’t get out of his apartment enough. This entry was posted in Film Reviews and tagged Gareth Evans, Penolope Cruz, The Dark Knight Rises, The Raid, Thomas W. Campbell, To Rome with Love by Thomas W. Campbell. Bookmark the permalink.